"This recipe forms a rather stiff dough, you might have to press it in the pan. One time I put raisins in the batter by mistake, and my husband loved them that way. 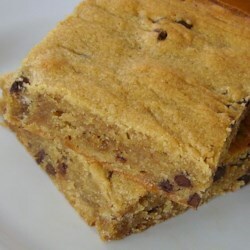 You can also omit the chocolate chips and have them plain if you wish." Mix peanut butter, butter or margarine, and sugars until creamy. Stir in vanilla. Beat in eggs. Mix in flour. Stir in 3/4c chocolate chips. Spread dough into a greased 9 x 13 inch pan. Bake at 350 degrees F (175 degrees C) for 20 to 25 minutes. Remove pan from oven, and sprinkle with the rest of the chocolate chips. Let stand 5 minutes and spread. Cool, and cut into bars. Time to get your nom-noms on! It’s peanut butter and chocolate in a bar. Very easy recipe. They never last long. They're great without the chocolate too.